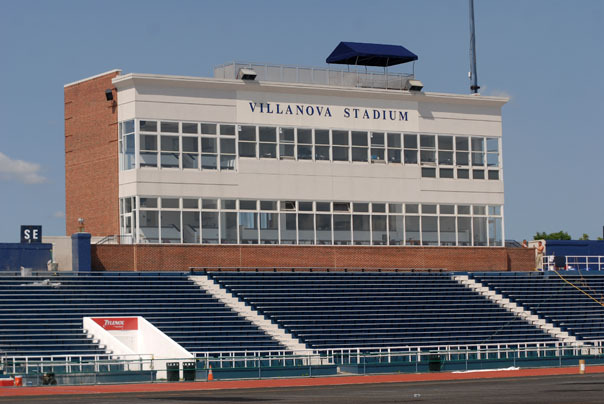 Villanova University Stadium, built over several decades, was in need to repair failing concrete in the seating area and also wanted to give their stadium a “face lift” to improve the appearance. In addition to concrete repair (both horizontal and vertical) tl1e inconsistent profile required an epoxy overlay to provide a uniform su1iace. The University also wanted to incorporate the school’s colors into tl1e seating area. The University utilized BASF’s GelPatch and 10-60 concrete repair systems for vertical and horizontal applications. TrafficGuard EP-35 Epoxy overlay system was utilized to provide a uniform surface. BASF’s Sonoguard system with a tint base topcoat provided excellent protection for horizontal applications and Thorocoat for vertical applications. All top coats were color matched to the University’s school colors.